It's easy to retrieve deleted WhatsApp messages when you deleted your Samsung WhatsApp Messages recently or less recently. WhatsApp recover deleted messages by Android Data Recovery after more than seven days. WhatsApp (WhatsApp Messenger) is an application currently available to users of the iPhone, Android, Windows Phone, WhatsApp Messenger, Symbian and Blackberry phones for communication between smartphones. With the help of push notification service, this application can instantly receive messages sent by friends and colleagues. It is free of charge to transfer sending SMS to using WhatsApp program to send and receive information, pictures, audio files and video information. WhatsApp is a very popular cross platform application for communication between smartphones. WhatsApp is registered on the basis of mobile phone number. When you register, you need to enter your mobile phone number and receive a validation message. Then WhatsApp will search for people already in use in your mobile phone contacts and automatically add them to your mobile phone contacts list. However, there is a question: how to retrieve deleted WhatsApp messages on Samsung? Don't worry, let me tell you. Part 1: WhatsApp recover deleted messages from Samsung within one day. Part 2: WhatsApp message recovery from Samsung within one to seven days. Part 3: WhatsApp message recovery of Samsung by Android Data Recovery. If what you want to recover the messages in the WhatsApp, the deletion is only within one day. you are lucky. Because it means it would be easy for you to restore the messages you just lost. Thanks to the strong function of WhatsApp, it will make a backup to your messages automatically by using both your local backup and Google Driver(if you have). So now let us see how to do it. Step 1: You need to uninstall and reinstall WhatsApp. Step 2: Enter your country code and phone number to verify our identity. After your phone number being verified correctly, you can restore your messages and medias from your phone's internal storage. If you don't restore now, you won't be able to restore later. Note: If you have signed in Google Drive account in your WhatsApp, in this step, you should sign in your Google Drive account. 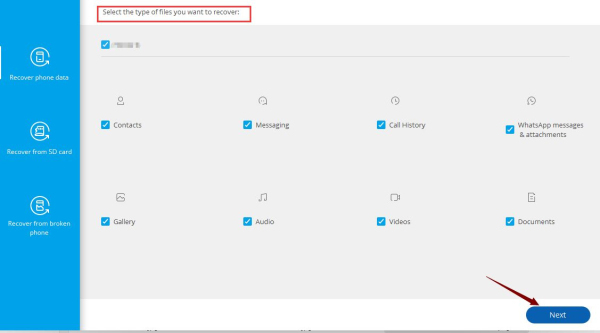 Then restore your messages and media from Google Drive. If you don't recover now, you won't be able to recover later. Step 3: Click on Restore to recover WhatsApp Messages on Samsung Devices. WhatsApp message recovery finishes. 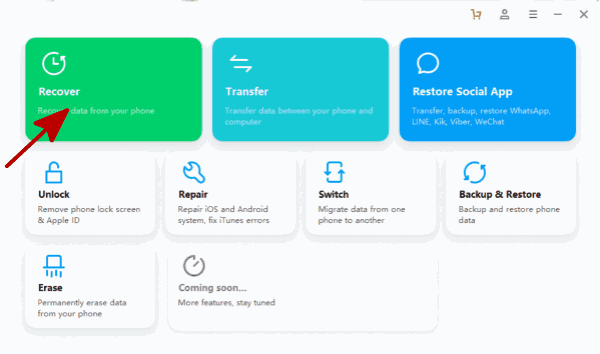 If you are not that lucky because the deletion of messages you want to restore within one to seven days, do not be so worry because there is still a solution. But you should turn off the Google Drive in WhatsApp. There only add some step than part 1. You must rename the backup file, and then operate the first part. So let's see the detailed step of WhatsApp message recovery from Samsung within one to seven days. Step 1: Connect your phone to the computer and enter the local backup folder: internal storage / WhatsApp / database. If your Samsung phone has SD card, you should turn to the directory SD card / WhatsApp / database. Step 2: In the local backup folder, the latest backup file has been named msgstore.db.crypt12 and the older backup file has been named msgstore-YYYY-MM-DD.1.db.crypt12. Here Y means year, M means month and D means day, and you should know that the local backup files can only show the latest seven days data of your phone. You should find out the file you want to recover in the local backup files and rename the file from msgstore-YYY-MM-DD.1.db.crypt12 to msgstore.db.crypt12. You can also rename the original msgstore.db.crypt12 to oldmsgstore.db.crypt12 or others to avoid rewriting. Step 3: Until now you can execute the same steps as part 1 to uninstall and reinstall the WhatsApp to restore. The third situation is that neither of the two solutions mentioned above is suitable for you since you have deleted WhatsApp messages for more than seven days, but the way you need to find back the messages you want will easy if you follow my instruction. Eelphone Android Data Recovery is the best choice for you, which supports to restore the data of Samsung S9 / S8 / Edge S7 / S7 / S6 / Note 8 / Note 7 / Note 5 / Note 4, Galaxy A9 / A7 / A5 / S10 / Fold WhatsApp. Now please follow my instruction. Step 1: Install and open the software, choosing the function of Recover, and connect your Samsung device to your computer then wait a minute. 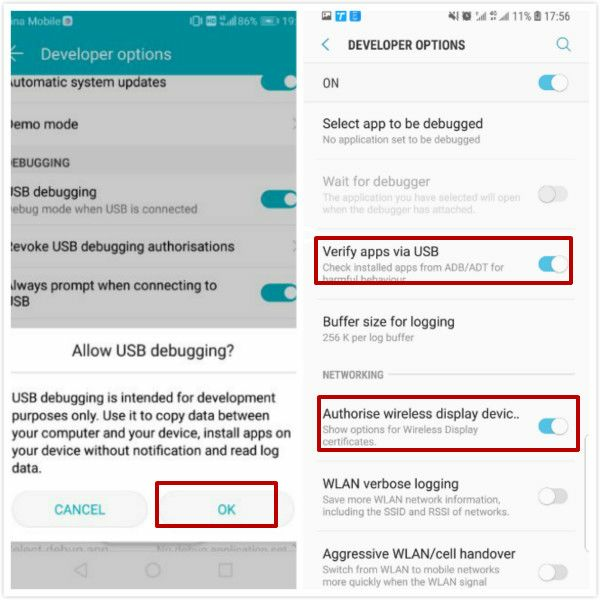 Step 2: After your phone has been detected successfully by the program, you need to choose the data you want to recover. Here you want to recover the messages so you should click the box Messaging, and then you can go on. 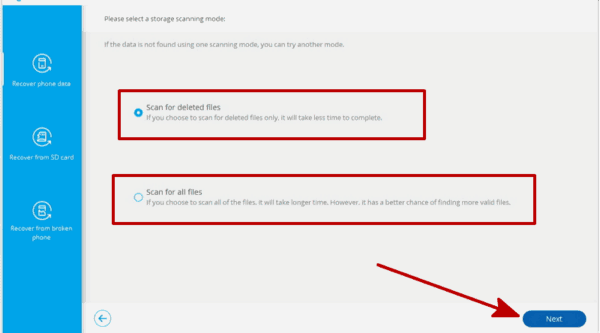 Step 3: In this step you need to select a suitable scan mode. 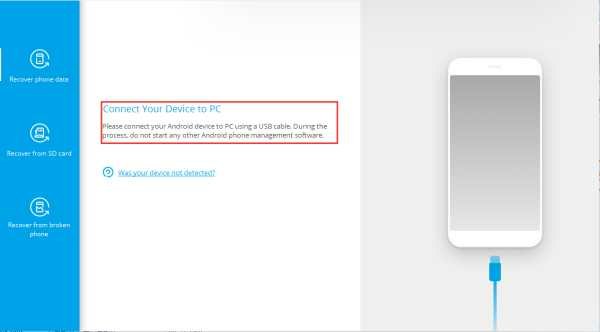 It is recommended that you first select the Standard Mode, which will cancel the root of your device after the recovery process and will not invalidate your equipment warranty. If the Standard Mode is unsuitable, you also get the second choice - Advanced Mode, which will scan in depth on the root device. Besides, you should note whether the power of your Samsung device is more than 20% or not to ensure the scan can complete successfully and then you can start. 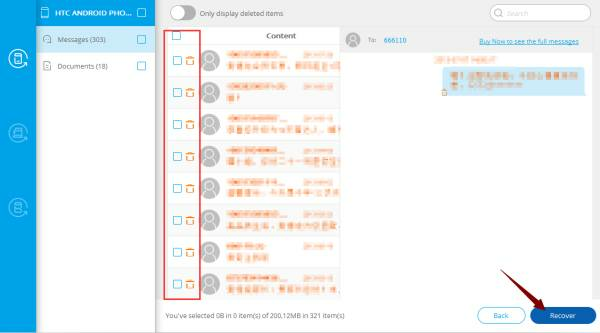 Step 4: When the scan is finished, the program will show you all of the messages in your Samsung device, which maybe is too much, but if you want to find out the messages you want you really need patience. When you find it, please click the box on the left and choose Recover button. Now you make it!